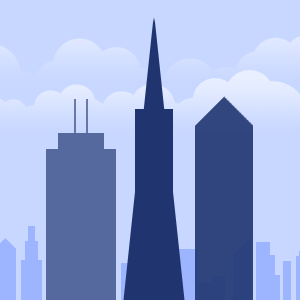 The Bank of America Building (also called Oakland Bank Building and Oakland Bank of Savings) is a high-rise located in downtown Oakland, California. It stands at 225 feet (69 m) tall. Originally built as a 9-story building, a 18-story section was later added. The Colonial Brookwood Center is a 9 story Class A office building located in Birmingham, Alabama between the suburbs of Mountain Brook and Homewood. The office building is owned by Colonial Properties Trust and is a part of the company's Colonial Brookwood Village development. Construction on the building began in 2006. The building consists of 9 floors, 4 of which contain parking and retail, and 5 that contain corporate offices. Metropolitan Courthouse is a highrise building on the northwest corner of 4th St and Lomas in downtown Albuquerque, New Mexico. The building rises 175 ft (53 m) and has nine stories. This is one of Albuquerque's newest highrises. 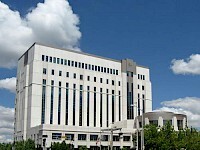 The Metropolitan Courthouse was designed by DCSW Architects and built in 2003. 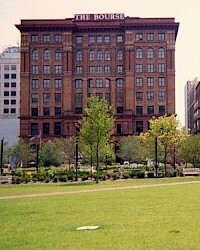 The Philadelphia Bourse Building was founded in 1891 by George E. Bartol, a grain and commodities exporter. It was modeled after the Bourse in Hamburg, Germany. Completed in 1895, it was the first commodities exchange in the United States. The architects were G. W. & W. D. Hewitt. Upon his return from a European trip in 1890, Bartol organized the Philadelphia business community. He asked each new member to pledge $1,000 to the project. 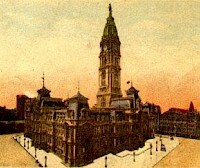 Philadelphia City Hall is the seat of government for the city of Philadelphia, Pennsylvania. At 167 m (548 ft), including the statue, it is the world's second-tallest masonry building, only 1.6 feet (0.49 m) shorter than Mole Antonelliana in Turin. The weight of the building is borne by granite and brick walls up to 22 feet (6.7 m) thick, rather than steel; the principal exterior materials are limestone, granite, and marble. The Watermark Detroit project is one of three condo developments chosen to fill sites along the Detroit Riverfront once occupied by cement companies. The project, previously known as Chene West, is the first to reach a development agreement with the city. Detroit businessman, former Piston,and current Mayor of Detroit Dave Bing said construction of the buildings, which will house 112 units that include condos and town homes, is expected to be completed by 2009.